So this post actually comes to you from the Outer Banks of North Carolina. This week I am getting some much needed rest & relaxation by soaking up some rays along the Atlantic coast. Being a bit of an avid photographer I am definitely looking forward to capturing some good shots. The seagull picture I have posted is from my 2006 Outer Banks gallery. On a topic more related to engineering, while taking a walk earlier today the civil engineer came out in me as I noticed some familiar marks on the road. Every 50′ along the road outside the house I am staying in is the road station. Admittedly I was caught off guard as I have never really seen road stations painted on a finished road back in Richmond, VA. But I digress. 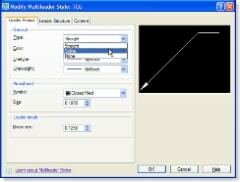 Arguably the two flagship features of AutoCAD 2008 are Annotative Scaling and Multileaders. I have of course written about annotative scaling in the past. Multileaders are truly a long-time AutoCAD wish come true. Personally it has always peeved me that there has never been a great way to have a single piece of text with multiple leaders associated with it. That is effectively the very scenario multileaders now provide a great solution to. Using multileaders we can now associate as many leaders as we want to a single piece of text. 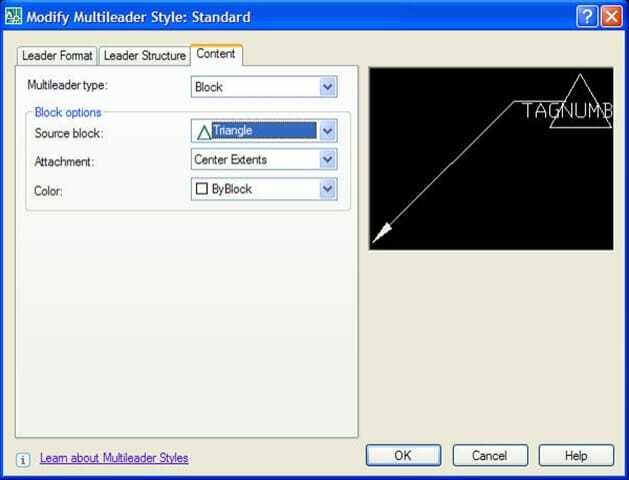 Making them an even cooler AutoCAD entity is the fact multileaders can be associated with both text or blocks. 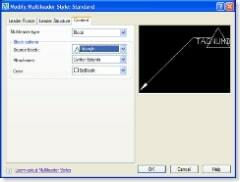 Furthermore in true AutoCAD 2008 fashion, multileaders can be made annotative. If you’re like me, you’ll undoubtedly find an endless number of uses for these things after learning about them. The basic multileader interface can be accessed a number of ways. Using the Annotation & Drafting workspace you will find the multileader control panel. For those not quite sold on the idea of using the Dashboard, there is also a new toolbar which offers the same functionality as the Dashboard. Both the Dashboard and toolbar offer a pretty intuitive interface. On the other hand, the multileader menu positions could be seen as both intuitive and counter intuitive. Drawing multileaders can be done by clicking Dimension > Multileader. On the other hand modifying multileaders is done by clicking Modify > Object > Multileader. Drawing a multileader is done almost the same way one would draw a normal leader. Click a start point, and position for the text (or block). Likewise in the same spirit as normal leaders, or shall I say dimensions, multileaders have styles which must be configured. Quite simply a multileader style can be configured to contain either text, or any attribute block. For me the ability to add blocks to a leader is HUGE! from either the multileader toolbar of dashboard control panel. Creating a new multileader style can be done by clicking the “New” button in the resulting dialog. For all intensive purposes this dialog is a simplified version of the dimension style dialog. Multileader styles are by default leaders to be associated with a block of text. The Leader Format tab gives the same basic options we have had in the dimension style dialog for some time now. One thing worth mentioning about the Layer Format tab is the leader type. Leaders being straight or splined has never been a part of the style itself, until multileaders. 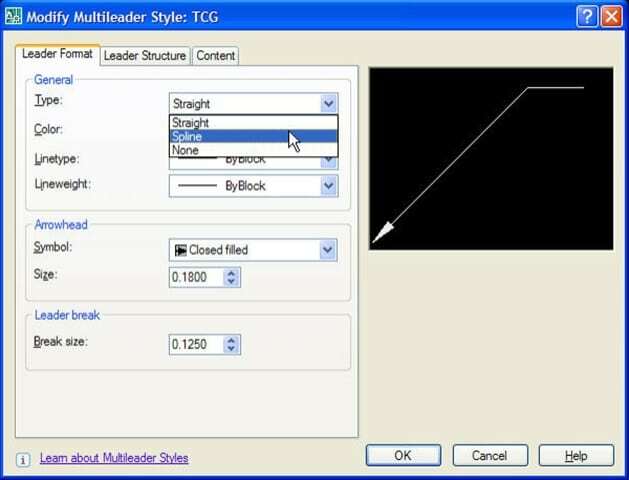 To spline a multileader, consult the General heading in the Layer Format tab. If you are working with a straight multileader, you will be given the option to specify the landing distance of your leader. The landing distance is specifying the length of the last leader segment which connects to either your text or block. Content tab. The dialog will change depending if you are configuring a text or block multileader. I find the inclusion of common blocks such as a circle, triangle, slot, box, hexagon, etc it particularly handy. While AutoCAD will allow us to specify any attributed block, I personally haven’t needed to make any custom blocks (to date). If you’re like me the wheels are turning about the endless number of ways you can utilize multileaders. Of course with so many uses for multileaders, you will likely end up with an array of multileader styles. That said, you will definitely want to keep either the dashboard or multileader toolbar up at all times. It likely goes without saying, the basic functionality of multileaders mimic the functionality of normal leaders. In an upcoming post we’ll take a look at how to draw multileaders and get the most out of them. At this point however, I am going to go outside and enjoy the numerous illegal firework displays that are going on. If I don’t have a chance to post before the 4th – Happy 4th of July to all of my U.S. readers. Be safe, and enjoy yourself! You wrote, you did not need to make any custom blocks for multi-leader styles yet. I have tried to use the pre-defined “Leader circle” block from the tool-palette. This draws the number not centered in the circle. I have tried to define my own multi-leader style, with a user defined block, which has the number in the middle of the circle. When I draw a multileader with my own style, the number is still not in the middle. If I explode it, the number jumps into the middle. Do you have any clue, how to redifine the pre-defined block _TagCircle, which seems to be wrong? Or any other suggestion to have the number in the middle for the first step?